I told you there would be more Mac n' Cheese recipes. 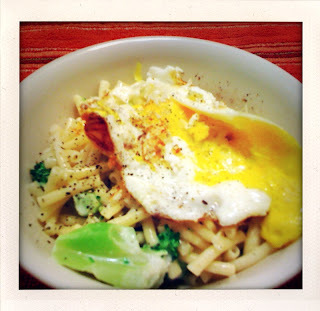 If you haven't noticed, I tend to sneak veggies like broccoli into my Mac n' Cheeses. I usually keep frozen spinach, broccoli and a bag of mixed veggies in the freezer as backup/emergency recipe additives. Broccoli tastes yummy with cheese and pasta, so it's a natural to throw in with any mac n' cheese. My favorite is Annie's White Cheddar & Elbows. The white cheddar is sharp and actually tastes like real cheese. Plus it actually is real cheese. If you don't have boxy white cheddar mac lying around, I recommend adding some shredded/pulverized parmesan to any other boxy cheesy mac you have to give it an extra strong cheesy flavor. Oh, and the egg. What you see pictured above is actually my breakfast from yesterday morning. I wanted an omelet, but didn't have any cheese. Cover pasta in a a pot or saucepan with water (about 6 cups). Bring to a boil and cook at Medium heat. After about 4 minutes add in broccoli (fresh or frozen). Cook for another 5 minutes or until done. Heat 2 tbsp of butter in the pasta pot on low heat. Place 1/2 tbsp of butter and garlic in a small skillet or frying pan set to Medium-High heat. Crack an egg in the frying pan when the butter melts. Bust the yolk open if you want to. I do. Add 1/4 cup milk and powdered cheese to pasta pot. Mix cheese, butter and milk together until smooth and creamy. Add pasta and broccoli back in and mix well. After about 2 minutes, pile as much pasta as you want in a a bowl. Salt egg in the frying pan. Remove egg from frying pan with spatula and place on top of Mac n' Cheese. Pepper to taste. Eat with fork and knife. Or just fork. That's what I did, but it was hard.